With its recent completion of a multi-million dollar renovation, everyone thought Gateway Mall’s troubles were finally behind it. Instead, 2009 proved to be one of the worst years in the shopping center’s 30-year history, with the departure of several major tenants and a pending fraud lawsuit filed against its owner. 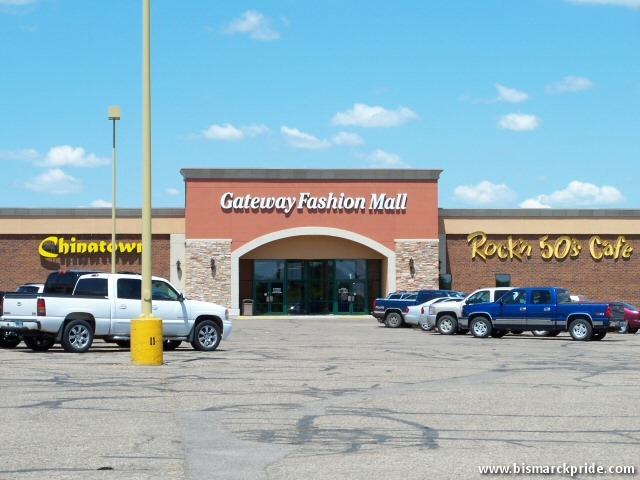 It was exactly 30 years ago last September that Gateway Mall opened in what was then the northern edge of Bismarck. With four powerhouse stores anchoring the center – national department store Sears, regional discount department store White Mart, national pharmacy chain Osco Drug, and long-time local department store A.W. Lucas & Company – Gateway Mall’s future looked promising. Gateway Mall lost one its anchors almost immediately after opening, with the closure of A.W. Lucas, who had been in business for 80 years. Despite this early stumble, things continued to look hopeful for the new shopping center. The former Lucas space was quickly filled by Saint Cloud, MN-based department store chain Herberger’s, who also had a location at Kirkwood Mall. White Mart was an anchor at Gateway Mall from 1979-1986. Gateway Mall took another hit with the closure of White Mart in 1986, making it the second anchor tenant to close within the center’s first six years. Within months of White Mart’s closure, regional home improvement chain Menards leased the former White Mart anchor – greatly expanding the space. With four strong anchors (Menards, Sears, Herberger’s, and Osco Drug) now firmly established, Gateway Mall started to flourish. The success at Gateway even caused strain for nearby Northbrook Mall, who had been experiencing increasing vacancies in the wake of Gateway’s opening. Gateway Mall’s glory days came to an abrupt end with the departure of Herberger’s in 1994, when the retailer greatly expanded its Kirkwood Mall location. This marked the second time that this specific anchor space had been vacated since the mall’s opening. Over the next decade, the space that originally housed A.W. Lucas sat mostly empty. It was, for a short time, filled by Plymouth, MN-based Jacobs Trading Company (later called World’s Greatest Deals), which was a clearance store similar to a Big Lots; however, its tenure was short lived, closing in or around 1997. Gateway Mall again lost an anchor in 2001, when Menards relocated outside the mall into a brand-new freestanding store. Unlike the Lucas/Heberger’s space, which was still sitting vacant, the spot left empty by Menards was immediately replaced by PrimeCare Medical Mall and Hancock Fabrics. The center anchor was finally filled by long-time regional furniture chain Conlin’s Furniture in November 2004, ending a near decade-long vacancy. For the next four years, Gateway Mall’s anchors remained stable, however the shopping center had difficulty maintaining many of its smaller tenants, including those located in the food court. At its prime, Gateway Mall’s food court had numerous tenants including Orange Julius, Subway, Papa Di’s Pizza, and Taco Tina’s. Today, the only tenant operating within the court is Subway. CVS/pharmacy relocated outside of Gateway Mall in early 2009. In 2008, it was announced that CVS/pharmacy, who had purchased Osco Drug in 2006, was relocating outside of Gateway Mall upon completion of a brand-new freestanding store. As anticipated, CVS completed its planned move in February 2009 – leaving a 15,000+ square foot space vacant. This would prove to be only the beginning of Gateway’s problems throughout 2009. Throughout the remained of the year, the newly rechristened Gateway Fashion Mall continued to lose tenants, some of which had been operating at the center for decades. In June 2009, it was announced that Joy’s Hallmark would be immediately closing its Gateway Mall location, and that Conlin’s Furniture had not renewed its lease and would be vacating by the end of the year. Interestingly enough, Joy’s Hallmark continues to operate at Kirkwood Mall, despite that it is one of two Hallmark stores located there. Shortly after this announcement, news of a pending fraud lawsuit filed against Gateway Mall’s new owner, Raymond Arjmand, became front-and-center. Plaintiff in the case, JAJVentures, who owned previous Gateway Mall tenants Joy’s Hallmark and Gelato D’Italia, accused Arjmand of fraud, misuse of funds, racketeering, and other allegations. It was also discovered that Arjmand was facing two similar lawsuits at shopping centers he owns in California. The lawsuit is still pending, however it has put considerable doubts on Arjmand’s ability to revitalize the dying shopping center. Hansen's Menswear relocated in October 2009. Another long-time tenant, Hansen’s Menswear, departed the mall last October after 30 years at the center. Interestingly enough, Cheryl Hansen has been the mall’s manager for the past few years. As expected, Conlin’s Furniture vacated its space at Gateway Mall on December 23, adding to the seemingly ever-growing list of vacancies. In what finally seemed like goods news for the center, Arjmand announced last October that he was close to closing on a major tenant that would lease a combined 70,000 square feet, including the former CVS and Conlin’s spaces. As of now, nearly three months later, this has yet to come to fruition. Sears is the only current anchor at Gateway Mall. It was confirmed, however, that Gateway’s only remaining anchor, Sears, had renewed its lease. Rumors of varying degrees had been circulating that Sears might depart the center, leaving Gateway Mall completely anchorless. The rumors had ranged from Sears and its sister store, Kmart, which is literally located across the street, would combine under one roof, perhaps opening a Sears Grand store inside the empty Home Depot building; to simply relocating; to closing all-together. With the departure of four major tenants in 2009 alone, coupled with already increasing vacancies and a pending lawsuit, Gateway Mall’s future seems bleak. Strolling through the mall on a Saturday or Sunday afternoon gives one a true perspective on the center’s current state. Dark, empty spaces where stores once operated line both sides of the mall from end-to-end. Often enough, Gateway Mall seems more like one big flee market than a shopping center. Even taking a visit one weekend afternoon during the recent Christmas season, Santa Claus was mysteriously absent from his chair in the corner.